A new member of the Simply Works Family. Adds the benefits of wireless control to all the features of the Click-On. 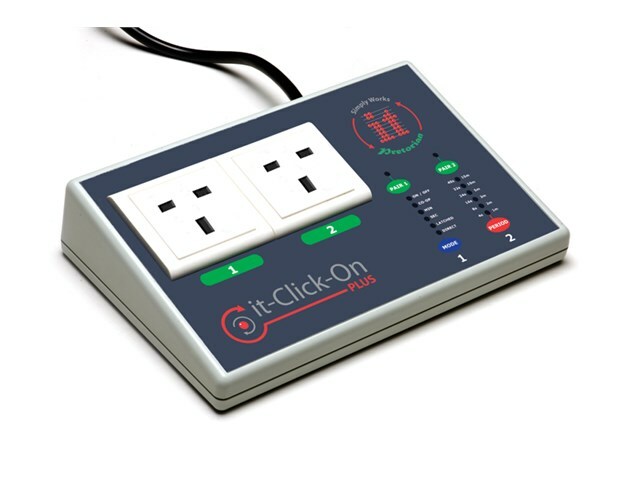 The it-Click-On Plus has a built-in Simply Works wireless receiver, allowing it to be controlled by Inclusive’s it-Switch as well as having two sockets for use with wired switches. Two mains sockets allow two devices to be controlled at the same time using the chosen mode settings. Has direct, latching, timed, two switch on/off and two switch co-operative settings using wireless and wired switches, singularly or in a combination. Single switch operation in Direct, Latched, Timed Minutes and Timed Seconds modes. Two switch control in cooperative and On/Off modes. Operates wirelessly with it-Switch up to 10 metres away. Operates with wired or wireless switches, or a combination of both. LED display for pairing with an it-Switch and selecting control modes and time settings.